PUTRAJAYA: The compensation for cancelling the East Coast Railway Link (ECRL) project is significantly lower than the debt the government would have to pay for the next 30 years if it was continued. 'The huge compensation is not as huge as the amount we are going to carry for the next 30 years,' said Prime Minister Tun Dr Mahathir Mohamad when asked if the government would need to pay a huge compensation should it decide to cancel the RM81 billion project. He said the government needed to cut back on expenditure as it had inherited large debts from the previous administration. 'As you know, we are burdened with very heavy debt... We just can't pay, we have to cut back on some of the expenditure incurred by the previous government. 'It is not because we don't want to honour contracts but we just can't pay. These contracts may cause us more than RM100 billion and it will impoverish us,' he told reporters after launching the National Anti Corruption Plan (NACP) here today. He also said he wanted all parties concerned to understand the government's predicament. 'We seek the understanding of the parties concerned. It is not because we want to just frustrate or to throw out a contract. It is because we are really tight in terms of finance,' he added. When asked about the statements made by several ministers on the status of the project, he admitted that some mistakes were made. 'Sometimes, some ministers make an announcement before it is due. I admit some mistakes were made but we are going to correct the mistake and we seek your understanding,' he added. Dr Mahathir also said Finance Minister Lim Guan Eng would soon give a clear explanation on the status of the project. It was reported last week that two senior ministers appeared to be at odds with each other over the ECRL project. Economic Affairs Minister Datuk Seri Azmin Ali had said the cabinet had decided on Thursday to cancel the project, but Lim said later that he was “shocked” by the announcement. An online portal also reported last week that the government had cancelled the ECRL contract with China Communications Construction Company (CCCC). 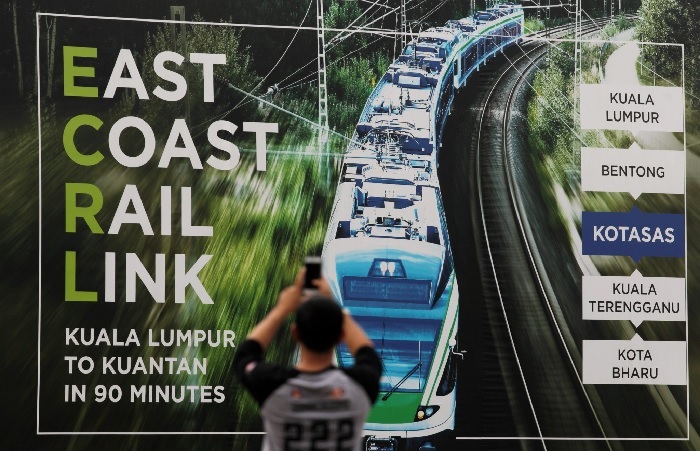 Quoting sources, the report said Putrajaya was looking for a new contractor to develop the 688km rail project connecting the Klang Valley to the east coast of Peninsular Malaysia at half of the original estimated cost of RM81billion.